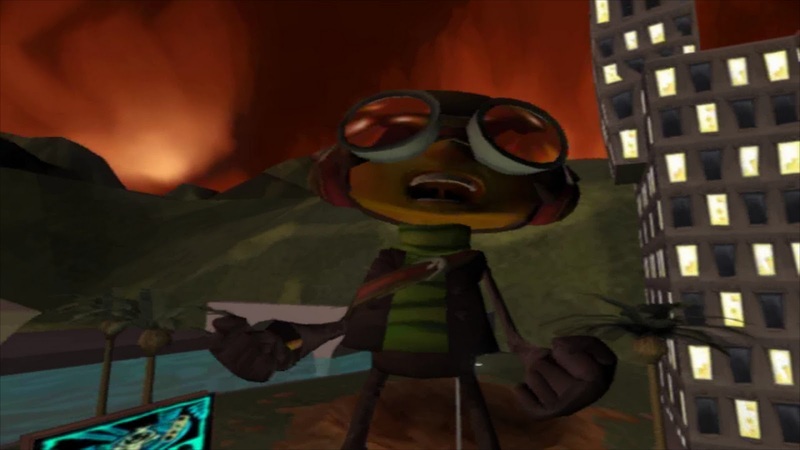 Picking a favorite place in Psychonauts is almost futile. 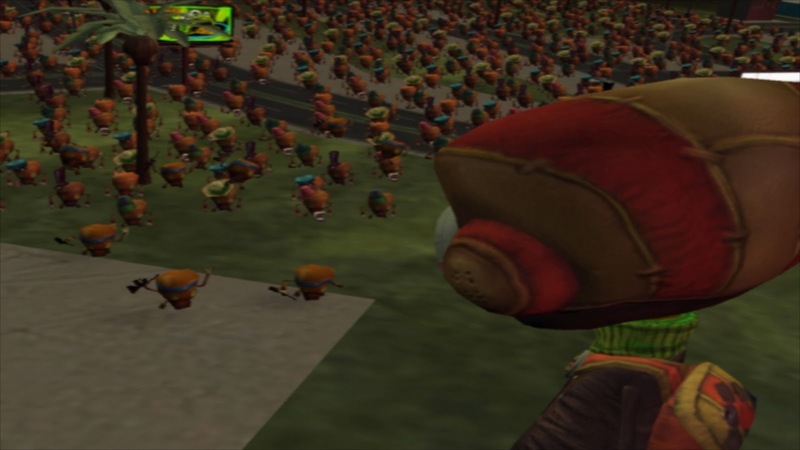 Every single level in the game is memorable and unique, as each one is the mind of a different character. While I'm not as big a fan of say, the 60s acid-trippy Milla's Dance Party level or Stella's Theater (although the play is hysterical), I will never forget the brain-twisting Milkman Conspiracy or the artsy-cool Black Velvetopia. Even as I was trying to narrow it down, I had trouble choosing between Waterloo World and Lungfishopolis. The mighty Goggalor won out. And yes, she's a lady. Her name is Linda. Show some respect. Linda has been brainwashed into stealing children for the shadowy villain of the game, and it's up to Raz to delve into her mind and figure out how to break her of his evil spell. No longer Raz, you are now Goggalor, terror of Lungfishopolis! 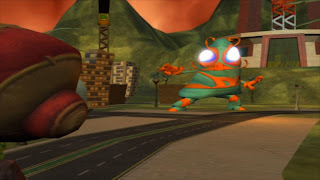 Your mission is to stomp through the city, fighting off the missiles and laser tanks and airplanes, climbing buildings, and ultimately fighting Kochamara, protector of Lungfishopolis. Or is he...? A group of freedom fighters begs for your...er, Goggalor's help in their fight. They've discovered that Kochamara isn't the hero that everyone thinks he is; he is controlling the minds of the Lungfishopolis citizens and making them his slaves! 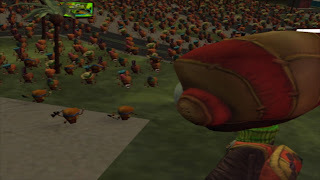 He must be stopped, and his mind-control tower must be destroyed! 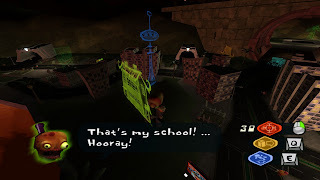 I think what really sets Lungfishopolis apart from the rest of the levels is the dialogue. 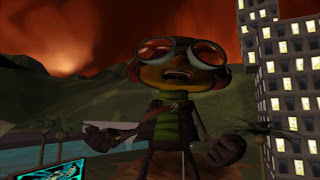 While Psychonauts is already a very funny game, the pedestrian terror as you trash their city is absolutely priceless. When you destroy a building, someone will cry out in misery. 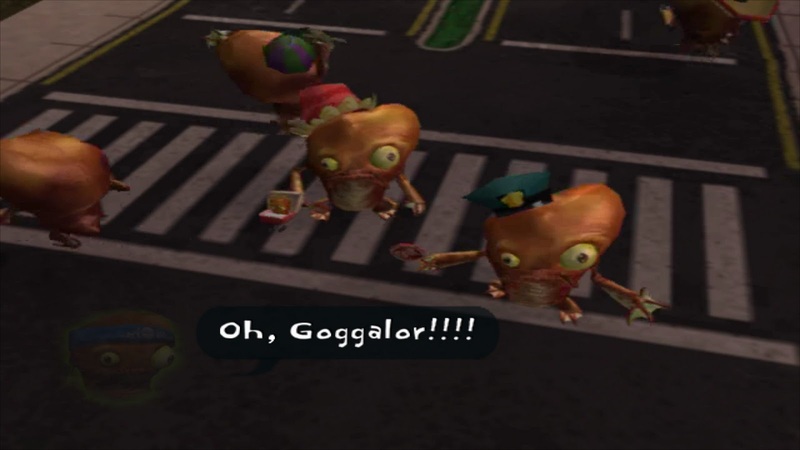 "Goggalor's headed for the orphanage!" "Nooooo, not the Natural History Museum!" "Oh no, it WAS the orphanage - for dogs! It was the puppy orphanage, everyone!" "Ahh! My mattress factory! I'm ruined!" And of course, what kind of giant-monster-destroying-the-city level would be complete without a full on kaiju battle as the boss fight? 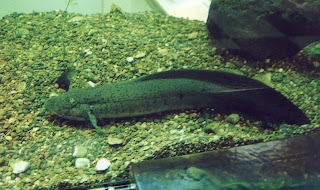 If Lungfishopolis has any faults, it's that it's just too short, and there's really not a lot to do. 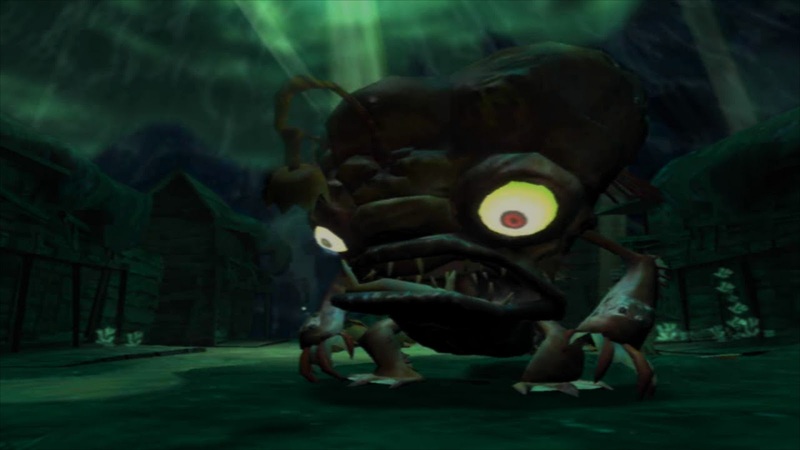 The dialogue is hilarious, the cutscenes are plentiful and funny, but it's easily the shortest level in the game. 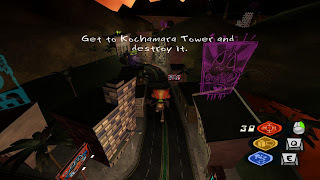 Fighting to Kochamara tower is really your only mission goal in the whole level (apart from a couple of simple yet mandatory sidetracks from the freedom fighters). I would like to have seen a little bit more, but it still won me over completely. And who can really complain when you win over the hearts of the newly-free citizens of Lungfishopolis?